Meets every Friday night in the Bourke Street Mall. Contact Andrew Walkington for more information or join the Melbourne team Facebook group. "Best night of outreach in 6 months!" 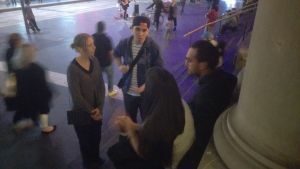 Watch this video update from our Melbourne team who went into Bourke Street Mall last night to share the good news of Jesus. 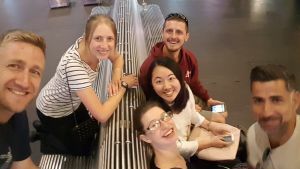 A quick video testimony from our Melbourne evangelism team who went out to the Bourke Street Mall on Friday night to share the good news of Jesus with the lost. 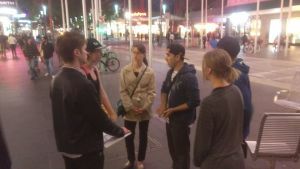 The Melbourne team was out on the streets again on Friday night, here is a quick video update from the team leader. Sophie () was a young lady from mainland China who was here on holiday for a few months. We met her late one evening in March and it turned out that she was a band new Christian as of a few months earlier. She was so excited by what we were doing that she joined us for quite a few weeks on the street while in Australia. On her second week she acted as translator so that I could share the gospel with 2 older men from China. Sophie stayed with us for quite a few weeks while she was here and we were thrilled to watch her grow in her confidence in sharing Jesus with people. Hopefully as she goes home she will be better equipped to share about Jesus with those around her. One evening we were struggling for decent conversations and so we posted a prayer request on Facebook. A few minutes later we bumped into an older Indian gentleman who was waiting for his family outside the shops. We began to share with him but within minutes his family came and joined us. His wife and older son returned to shopping but the father and younger son were very keen to talk. They knew nothing about Christianity beyond the fact that in India it seemed to attract poor people. We were able to step through the gospel in great depth with them and they were both intrigued by the message and very thankful for us taking the time to explain it to them. One April evening most of our team seemed to find really long conversations. 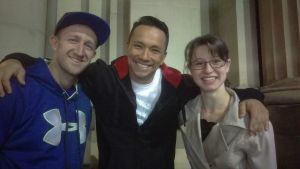 Canaan & Peter chatted with this Atheist for more than an hour and were able to share the gospel in great detail. At the same time, Troy, Amanda and I started a chat with two young British guys who were both very interested. Within a few minutes Troy and Amanda headed off for other conversations leaving me to chat with the 2 guys for more than 90 minutes. One was fairly clueless and knew almost nothing about Jesus. He asked brilliant questions and so often he asked about the next thing I wanted to share with him. The other guy was nominally Muslim from Egyptian descent and knew lots about religion. He was often able to jump in and explain crucial concepts and was many times almost doing my job for me! He also had so many questions and was thrilled that I was the first Christian he had met who could provide reasonable explanations for some really hard topics. We don't do open-air preaching very often but we had a go a couple of weeks ago. 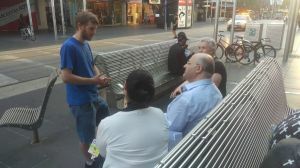 Not many people stopped to listen but afterwards Brad and Dave (far right) stopped to chat as they were also out doing evangelism in the city. 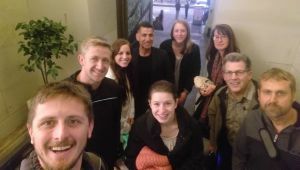 To our surprise we bumped into them the following week as we gathered as a team and they joined us for a couple of hours of ministry. During that same week we were contacted by Lacey (3rd from left) who is here from the US for a short study trip. 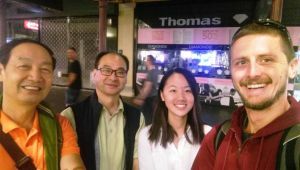 She had been grieved by the lostness she was encountering here in Melbourne and had Googled for evangelism teams in Melbourne and found us. She will join us for the remainder of her study trip. As many of you know, On Friday 20th January, a deranged man drove his car into Burke St mall and struck and killed a number of innocent people. As a result, the mood the following week was very different. Usually Burke St Mall is dominated by the sounds of very talented musicians busking and groups of people having fun, but this week things were very subdued. There was an astonishing collection of flowers left outside the GPO building as an impromptu memorial. We set out to preach and at first we were a little gun shy because of the mood, however we found the events of the previous week caused many to think about mortality. Simon spoke to John and Tracey (pictured). John had a Catholic background and so Simon spoke to him about the relationship between works and grace. The Mall is very multi-cultural and we meet people from all over the world. Andrew spoke to a couple of different French groups and to a couple of Nepalese guys whose girlfriends got bored and walked away! He also spoke to a group of pastors from New Zealand who tragically could not between them articulate the gospel. The best conversations of the night happened near the Memorial. Andrew and Elise spoke to Luke and his friend Naomi who were reading cards left with the flowers. They were both very open about eternal matters and Luke was really keen to read the Bible for himself. Andrew gave him a Bible and pointed him to the Gospel of John as a starting place. The best conversation of the night was with Raj, a Sihk guy who works security for a shopping complex on the Mall. The team has now spoken to him a few times and given him a Bible. He regularly asks great questions but at the same time he seems to be grasping for objections and trying to find reasons not to believe. There were many great conversations this week. Canaan and Amanda were able to share with Milee, a young lady who had been put off Christianity by her family and with John a catholic and his Mormon wife, Anne. Simon and Troy talked with Louis a spiritualist, and Arkash who was from a Hindu background. Andrew chatted with James, a Navy guy with an Anglican background who was employed in some sort of confidential role! This was Simon's last night with us before he flew out to serve with MAF as a missionary pilot in Arnhem Land. We were sad to lose him but encouraged that he will be preaching the gospel wherever he goes. Canaan chatted with a young man name Finn who was raised Catholic. He was very agreeable so it was a little difficult to see if he really held certain beliefs or was merely being polite. He had a right view of God's justice in punishing sinners and the need for forgiveness, even to the point of saying that he would be deserving of Gods wrath if he died. Unfortunately, he just seemed a little apathetic about it all. There were huge numbers of tracts handed out that night (compared to normal for our small team) but comparatively few conversations. The night started with a group of Mormon missionaries and a group of people giving out free hugs. The free hugs were nice enough, but the givers could not come up with a consistent motive for why they felt this was important. ​Andrew was able to share with one of them about the Gospel. The Mormons were interesting. Canaan and Amanda spoke to 3 and Andrew and Elise spoke to 3. Andrew was able to speak to them about the integrity of the holy books as a reason to trust the Bible but reject the book of Mormon. He then transitioned to the differences in our respective understanding of atonement and about how Jesus had completed the payment for our sins, not just contributed to it. The young Mormon missionaries were intrigued by Ephesians 2:8-9 but then the leader of the group (from Canaan's conversation) burst in and declared that they all needed to head back now and that this conversation was pointless. Andrew declared that it was anything but pointless because one of us was clearly wrong and our souls were at stake. This angered the leader who left while the young Mormons lingered to read Ephesians 2:8-9 from their own preferred translation. Andrew, Nick and Elise met Sergio (middle of photo) from Brazil who knew the right answers but seemed to lack a lot of fruit. Andrew challenged him about what true repentance looks like. Canaan and Amanda finished the night chatting with this young couple who were quite friendly and reasonable. The guy was taking things in and seemed to be thinking through the Gospel rightly. The lady had a lot more objections, but it was nice for her to question back and forth and give her answers on things. 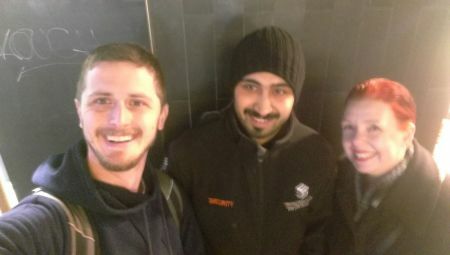 There are many wonderful things happening on the Melbourne team and we promise to write updates more often! Please continue to pray for us! 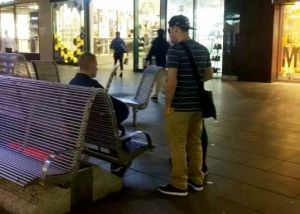 After many weeks of 1-1 witnessing in Melbourne, and with Christmas upon us, this past Friday night we added open-air preaching to our ministry. God had been blessing our faithfulness with a slow growth in numbers for several months and so it was decided that we now had the critical mass to run open-air. Our team met for prayer and then a few of us set up a tract table, a sketch board and PA in the mall while others walked off with hands full of tracts. With the massive crowds gathered in the mall for Christmas, it took less than 10 seconds to attract a crowd of 30-50 people. Many did not stay once they heard it was about Jesus, but quite a few remained for the whole message and were then followed up one on one. 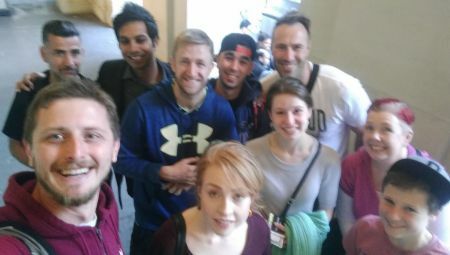 While the preaching was happening, Hannah and Aditya met up with Helen, a non-believer Hannah had a week earlier who had demonstrated a very strong interest in the gospel. As they met with her this week, she was clearly impacted by both her sin and the love of Jesus to rescue her. While sitting with the 2 team members, she prayed and repented of her sin and asked God to rescue her. For many months, we have tried to establish a Melbourne based ministry with only limited success. In the past 3-4 months, teams of 2 to 4 people have gone out Friday nights to share the gospel and by God’s grace we have had many wonderful conversations. This week was different. 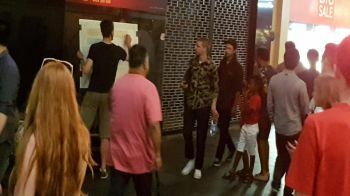 Just 2 hours before our 7pm start time, people began to indicate that they would be out with us on the streets and by 6pm, we had 11 people committed to join us on the streets for the evening. This was a massive answer to many months and even years of prayer. 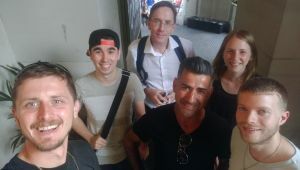 We gathered together at the GPO building to pray and get organised and then with tracts in hand, we paired up and walked out into the mall to share about our Saviour. Within just a couple of minutes I could see that almost every pair was engaged in conversation. Up and down Burke St Mall there were people sharing the gospel. We talked to Muslims, Hindus, Mormons, Buddhists, Agnostics, lapsed Catholics and a couple of atheists. Many of the people in the mall are tourists and so we often share with people who are from relatively closed countries where mission work is difficult. Several people from the team obtained phone numbers to follow up people they chatted to. One notable conversation from the night was with 2 girls from Bendigo who had a strong Catholic background. They had little understanding of the gospel but were very open to talk and asked some brilliant questions. Towards the end of the conversation it was clear that the message had got through to them, but rather than submit to the gospel, one started trying to find excuses to not believe. She seemed to be grasping for a way to wriggle out of repentance. A couple of our team had to leave early but when most of us gathered back at around 9:30pm to debrief, everyone had great stories of people they talked to. Even though some of us were tired from our labour there was a genuine excitement about what had happened during the evening. We are immensely excited for where God is taking this ministry from here. 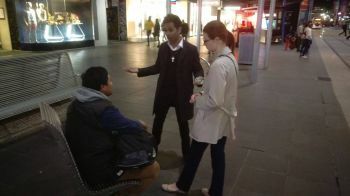 Friday night was the official restart of ministry in the Melbourne CBD. Though there has been significant interest from people down here in street evangelism, we have struggled for a fair while to establish a regular team. In the past 2 weeks it was decided that team or no team, we would go and start preaching the gospel, even if that meant we struggled for numbers for a while. We stepped out in faith, also trusting that once others hear about the ministry, they will join us. The first night was just two of us. We grabbed some tracts and started chatting to people. The first good conversation was with Ali who claimed to be a Muslim (pictured centre). Ali was very interested in hearing about Christianity and we were able to step through the gospel with him and leave him with several tracts. He asked for our contact details so that we might continue the conversation later. Very few people were taking tracts, but after a few minutes we approached a young Muslim girl who gladly answered our questions. Shortly she was joined by another Muslim girl and eventually another Muslim gentleman overheard us and joined in too. We explained to them why they needed a saviour and why Jesus needed to be God to be a sufficient sacrifice for their sins. All three were very challenged by the gospel and each took a tract and a gospel of Mark. It was not a big start for a new ministry, but we pray that by God's grace he will raise up more faithful labourers to preach with us.